Donuts and Milk: Doesn't this just look so quaint? 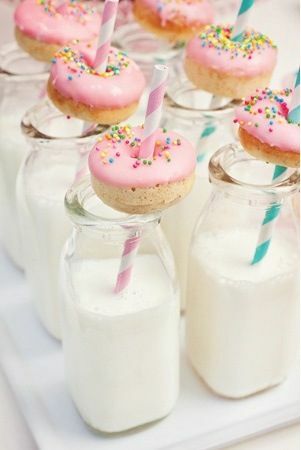 Frost your donuts in your wedding colours and pair with matching straws for a cute visual effect. These would be the perfect midnight snack too! Popcorn Bar: Who doesn't love warm and buttery popcorn right? Pre-make your popcorn or hire a popcorn maker and adorn your table with paper bags and assorted salts for your guests to help themselves. Don't forget to add chocolate and candy pieces to your bar for guests who have a sweet tooth! Coffee Bar: If you're a coffee-lover, then this seems like a natural choice right? Make it interesting by including a variety of blends and flavoured syrups to your table. Offer biscuits or chocolates to be snacked on with the coffee and give your guests freshly ground beans of your favourite blend as favours. Milk and Cookies: This is the classic take on the donut and milk idea we mentioned earlier. We think this would make a fab midnight snack too. Keep things interesting by offering a variety of cookie types. Chocolate Chip and Oatmeal are our favourite choices! Tacos and Margherita's: If you love Mexican food, why not serve your guests mini tacos with a shot size portion of Margherita? Switch it up and offer a variety of taco's. Fish and Chicken tacos are a must!